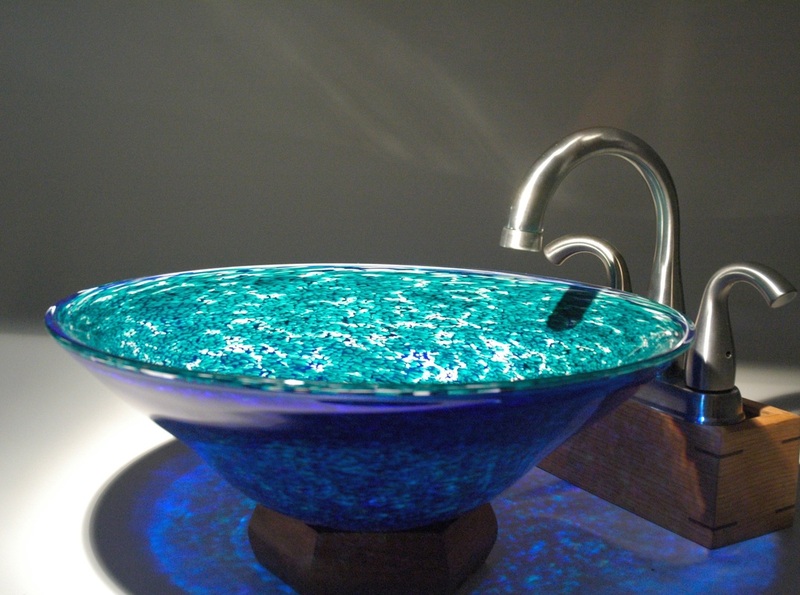 The Confetti Series of hand blown glass sinks are decorated with small confetti-like splashes of color. A sprinkling of opaque white is often applied under the rich transparent colors to enhance and intensify their natural brilliance. The unique color application method used allows the mixing of two, or more, colors. This method also adds the possibility of choosing differing colors for the interior and the exterior. The standard diameter is between 15"-16" with a depth of between 4"-6". Drain holes are drilled to the standard 1 3/4" size, and tapered & polished to accommodate any brand of drain. Bases are machine ground to 4" in diameter, ensuring a secure & level installation. Being a handmade process, there will naturally be slight variations in size and form. Requests for shallower or deeper forms are fine, but will be considered "custom" if outside the standard 5"-7" range. Smaller diameters can also be created with no additional charge, but will be made to order. Larger diameters up to 18" are available, priced upon request. Add a splash of color to your home. While we try to accurately photograph & portray colors as best as possible nothing is as accurate as an actual glass color sample. We offer free color samples so you can be certain to get the exact color you want. To order color samples please call . I enjoy experimenting with new colors and designs. Whenever I discover something special I will add it to the site. If there is a color that you would like to see here, please click the "Contact Us" tab to let me know. I think we have a nice wide and rich color pallet, but sometimes "it's hard to see the forest for the trees" when you are in the middle of it all. Thank you for spending the time to view the Fire Dancers Glass site. I hope you have enjoyed it. Please bookmark it and visit often to see "What's New".